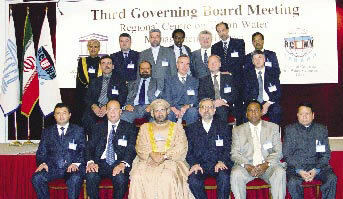 According to the Director of the Regional Center on Urban Water Management - Tehran (RCUWM-Tehran), located in Islamic Republic of Iran, three years ago the General Assembly of UNESCO decided to establish this Center, which is managed by the Council of States of the UNESCO Member Countries and other international organizations interested in water issues. Dr Reza Ardakanian, the Deputy Minister for Water Affairs, Minister of Energy, who is also the Director of the RCUWM-Tehran, pointed out in a press conference that the Meeting covers discussions on the development of urban water resources and the management of water-related issues. He added that Iran’s efforts to gather those countries that have similar climatic conditions and water-related issues played a significant role in bringing about the meeting, this year, in which the Minister of Water and Irrigation of Egypt, the Minister of Water Resources of India, the Minister of Water Resources of Bangladesh, the Minister for Water of Tajikistan, and high ranking representatives from Syria, Kuwait, Lebanon, Germany, and Holland, as well as from such organizations as UNESCO, International Water Association, and International Water Academy, participated. All these participants had meetings with Iranian ministers and the President, Mohammad Khatami. In the Meeting, the Iranian Minister for Energy, Engineer Bitaraf, expressed his joy for the growth in the number of member countries in the Council, to 16 including Iran and UNESCO. He added that Iran had done a great deal to improve management of urban water resources through building of many dams, especially during the past eight years. "Iran has not only become self-sufficient with respect to study, design and execution of dam projects" he added, "it has in fact acquired the ability to build dams in other countries as well". He further pointed out that presently Iran is building 85 large reservoir dams, which makes it the third country worldwide with regards to building dams, and this, he added, is confirmed by the statistics issued by International Commission on Large Dams (ICOLD). Furthermore, he announced Iran to be ready to put at the disposal of other countries, the neighboring and regional countries in particular, its experiences, and knowledge with regards to water, water treatment, dam building etc, and to exchange ideas with other countries of the world.